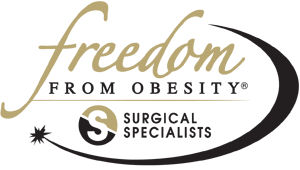 Dr. Merriman of Freedom From Obesity® is the most experienced bariatric (weight loss) surgeon in the Arkansas, Texas, Louisiana region. Through dedication and a commitment to new innovations in surgical obesity help, Dr. Merriman has remained at the forefront of the bariatric surgery industry. Our practice offers everything from effective surgical weight loss solutions to comprehensive support, educational resources, information, dietary guidance, and emotional support. We offer a variety of different surgical options for our patients including Lap Band or gastric banding surgery, Gastric Bypass Surgery, Vertical Sleeve Gastrectomy, and Revisional Surgery. Our patients considering bariatric surgery attend a free information session prior to surgery to ensure they are fully aware of the process and the expected results. They also receive ongoing monthly support group meetings with the goal of sustaining increased health and well being while attaining weight loss goals. Dr. Merriman offers a kind and compassionate approach and provides each of his patients with the tools they need for success well after their surgery. Our website has many informational resources and videos for guidance and education. Please browse our website and then contact us to schedule an initial consultation in our office. We are conveniently located near to the areas of Shreveport, Louisiana, Longview, Texas, and Bossier City, Louisiana. We are ready to assist you in your journey towards weight loss, improved health, and enhanced well being. If you are ready to explore obesity help through weight loss surgery, contact us today by calling (318) 222-4282. What is the biggest change in the treatment that you have seen over the life of your 30 year career? Currently, the biggest change lies in our understanding that the basis of the obesity problem is not what we thought. When I started my training in the early 1980s, I was taught that a gastric bypass was curative of morbid obesity. We had a woefully inadequate understanding of the problem. Many patients suffer with uncontrolled Reflux or GERD. Many are on daily medications and still don't have adequate control of their symptoms.